June is Gay Pride month. On June 28, 1969 at the Stonewall Inn in New York City, police yet again made a raid. Lesbian, Gay, Bisexual, Transgender, and Queer (LGBTQ) people had tolerated the abuse from police long enough. So, when push came to shove during biased and unreasonable raids and arrests, it was the drag queens who protested, and the modern Gay Rights movement began. Such treatment was common fifty years ago, and we are still raising the banner of Gay rights today. As a Christian man, who happens to be Gay, I find myself in a peculiar position. On the one hand I am homosexual, not by choice but by God’s design, and I have a place in the LGBTQ communities. On the other hand, I am Christian, by choice and devoted to Jesus the Christ, who saves from danger and brings salvation. 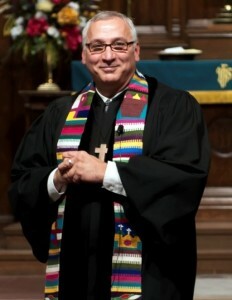 As the pastor of a small (but faithful) Christian congregation in a conservative environment, I have had many people say to me, “You have a wonderful congregation, I’m surprised your Church is not bursting at the seams with Gay people due to the extravagant welcome you offer to everyone.” I remind them that God’s LGBTQ children have been beaten and battered, hated and excommunicated, preached out (if you will) and barred, not only by their families, but by their Church. Although this verse seems to be saying that the world will hate me because as a follower of Christ I have been chosen out of the world, truth be told, the hate expressed by Christians has done a number on God’s LGBTQ children and in many cases given us few choices except to curse and denounce not only the church but God. So where then does one go for spiritual community? Who will nurture LGBTQ people and love them as God loves, if not Christians? Throughout the modern Gay rights movement LGBTQ people have had to stand firm and be diligent to fight for the same rights as others. This struggle has touched every element of our lives, including our spiritual lives – yes Gay people have spiritual lives. So, as we celebrate Gay Pride in June, I say, “March on LGBTQ children of God, march for love and hope and a just world for all!” Peace be with you!